Site Redesign: What do you think? Just a reminder that Friday, February 27th, and Saturday, February 28th, Post Road in Wayland, MA, Upper Falls in Newton, MA, and Auburndale in Newton, MA are having a 25% off sale -and- a Grand Tasting with 100 wines for sample and sale. More info available here. Upper Falls still had a little bit of this one available as of yesterday, but it was going fast. I believe the Upper Falls location is now sold out of this one. You may want to try Post Road or calling ahead to check inventory. Recommendation from "Doug" on the sales floor. A spendy Napa Cab- better be good! Neal Family is frequently mentioned as one of the best wineries to visit in Napa so I wanted to check out their wine for a potential future winery visit. My cousin Michelle recommended Adelsheim in general and although I've been looking for their Pinot Noir at a good price, I haven't found it yet. I like Pinot Gris too, so I'm looking forward to trying this one. A friend on Twitter mentioned this one when I tossed out the question: "Name a $20/90-point Wine Spectator domestic Pinot Noir" This wine wasn't rated by Wine Spectator, and it was more than $20 *but* he said he liked it so I'll give it a whirl. Discovered this white wine just last week and it is amazing. Another friend on Twitter raved about it as well so I thought I'd pick up another bottle because spring is just around the corner. Isn't it? Caught a recommendation on this one from a trusted source on Corkd who called it the best Riesling he's ever had and gave it 96 points. Recommendation from Mike Jr. on the floor. Of all the wines in the store he could recommend, he made a beeline for the sub-$10 Spanish red. Recommendation from Mike Jr. on the floor. I've heard good things about A to Z. Thought I'd give it a try. They also had the highly sought after 92 point 2006 Villa Pillo Toscana Borgoforte still available, but I didn't buy any because I still have a half case remaining. One other I spotted and would recommend is the 93 point 2007 Seghesio Sonoma County Zinfandel. Question of the Day: What do you think of these picks? Are you planning on going to the tasting on Saturday? $15 is pretty steep for one of these. However, while I was at a Christmas Tree Shop in Natick, MA recently, I spotted some of these for only $2.50! It was made by Pedrini, a brand which I usually associate with being an above-average Home Goods/Marshalls manufacturer. UPDATE (1/11/2010): I stopped using these wine stoppers after a while because they frequently failed to maintain a seal after 24 hours. The flanges on the stoppers seemed too wide for most bottles making them hard to get into the bottle in the first place. This created an ambiguous situation regarding whether the seal was in place after vacuuming it closed and ultimately I was more pleased with simple $1.95 stoppers like the ones featured in this piece on short-term wine preservation. Like hearing about deals like these? If so, please consider subscribing to The Wellesley Wine Press. 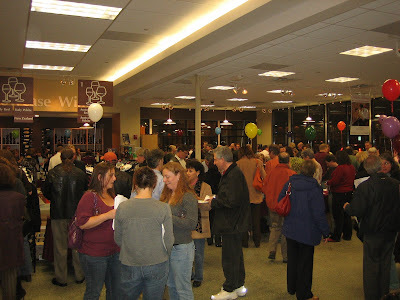 On Saturday February 28th, 2009, Upper Falls Liquor in Newton will be having a free grand tasting of over 100 wines. Even better, they'll be offering 25% off the purchase of 6 or more bottles of all of their wines (with the exception of already discounted "red tag" items) on both Friday the 27th and Saturday the 28th. The other two stores in this group (Auburndale and Post Road) are also participating. More information is available on their website. If you'd like to reserve some of your favorite wines, it might be worth calling to see whether they can accommodate. Try mike@upperfallsliquor.com at (617)969-9200. Their rotating monthly specials require the purchase of only 6 bottles whereas other stores require 12 bottles or more to receive their best pricing. They carry a good assortment of price points. Both good quality-price-ratio daily drinkers -and- higher end wines which allows you to build up 6 or more bottles without breaking the bank. Their 3 locations in the Boston MetroWest area make it convenient to stop in while running other errands. I'll probably stop in on Friday to pick a few things up and then back on Saturday for the tasting if I can swing it. Hope to see you there! Do you like hearing about local wine events like this? If so, please consider signing up for a free subscription to The Wellesley Wine Press so you don't miss a future update. As is being discussed in this thread on the Wine Spectator Forums, the 2007 Merry Edwards Russian River Valley Sauvignon Blanc received 96 points in a recent Wine Spectator Insider (subscription required). At a release price of $29 and 3,880 cases produced, this may be one you'll want to consider as part of your wine shopping over the next couple of months. Sauvignon Blanc is a wine I always associate with tasting in Napa for some reason. For me, it's been a variety that I always taste and think "Hmm. Tasty white wine. Where's the Cab?" However, I've grown to appreciate it more over time. We've especially enjoyed the always delicious, readily available, and relatively affordable Kim Crawford Sauvignon Blanc. James Laube, Wine Spectator's lead taster of California wines, called this wine the best Sauvignon Blanc he's ever had from anywhere in a recent blog entry (subscription to Wine Spectator required). That's high praise, especially considering the great Sauvignon Blancs that come out of France and New Zealand. It should be noted that MaryAnn Worobiec actually assigned the 96 rating- Laube just backed it up with his additional praise. It's interesting to contrast this with Gary Vaynerchuk's comments that all the Sauvignon Blanc in California should be torn up, evidently preferring the way this grape is produced in other countries. He also notes that, in his opinion, more people will naturally gravitate to Sauvignon Blanc than Chardonnay (America's current "queen" of wines, to Cabernet Sauvignon as the king). I tend to agree with this given Sauvignon Blanc's approachable tropical and grapefruit flavors. It's downright tasty stuff. I hear that Upper Falls Liquors in Newton, MA *may* have some of this wine coming in. Give them a call or drop them an E-mail if you're local and would like to get your hands on this wine. If this one is a little more than you'd like to spend, try this sub-$10 domestic Riesling. Also a great value. This readily available and inexpensive New Zealand Sauvignon Blanc just might be the perfect warm weather party wine. Question of the Day: Have you seen the 2007 Merry Edwards Russian River Valley Sauvignon Blanc in stores? Have you tried this wine or prior vintages of Merry Edwards Sauvignon Blanc? If so, please leave a comment and let us know about it. Guest Post: Is Trader Joe's a Good Place to Buy Wine? This is a guest post from Jason from Jason's Wine Blog: A view from inside the glass of a professional consumer… You can find my response to this same question on his site here. The more I considered this question the more it seemed an opportunity to take a trip down memory lane. So let me do so while accentuating why I think Trader Joe’s is indeed a great place to buy wine. What led me to wine? More specifically to Trader Joe’s wine? Three words: Two Buck Chuck. I used these wines as a launching pad for further exploration. For $2 I could learn what varietals I liked more than others. Back in those days I think there were only three options but it provided me the confidence to go deeper into the wine aisle. Trader Joe’s is an excellent, low cost resource for those trying to learn the basics. I know the basics now let’s learn more. Trader Joe’s literally has over a hundred bottles of wine for less than $5.99. These wines are of all shapes, sizes and varietals arriving from around the world. 99% of these, while nothing special to a connoisseur, are just fine to the vast majority of the wine drinking public. Trader Joe’s has a plethora of easy drinking, quaffable wines. Now I know I like wine, I’ve learned more. What’s next? Time to start exploring the world of wine. Trader Joe’s excels at offering varietals and regions you may have never heard of. Epicuro immediately comes to mind with its four unique Italian varietals; Aglianico, Salice Salentino, Nero d’Avola and Vermentino. Whether it’s a Pinotage from South Africa or a Chardonnay from Tasmania there is always something new on the shelves at a price suitable for exploration. One important rule here. Introductory offerings are meant be just that; a first impression and a learning experience. For instance, I didn’t care for the South African Pinotage I mentioned earlier, that doesn’t mean I’ll never have another wine from South Africa or another Pinotage. If you don’t like your first experience with a varietal or region remain open to trying it again. Somewhere in these first three stages it inevitably happens. You stumble on a wine that catches your attention with subtlety, nuance or complexity. You like it. Now just a quaffer isn’t good enough. So you start looking for more. This is where problems set in. Many novice consumers when thinking of a nice wine immediately gravitate to Napa Cab or Boudreaux. Getting access to high quality grapes in these regions is a highly competitive, costly exercise. These bottlings are the most expensive in the world. Those factors combine to make the wines that come from the most coveted areas the weakest in Trader Joe’s portfolio. For that reason, I believe this is where many sour on Trader Joe’s wines. When I get above a certain price bracket, for me $7.99, I start to lean toward spending my money with a local wine merchant. In fact, I can count the number of times I have spent over $10 on a bottle of TJ’s wines without using all ten fingers. My way of saying, Trader Joe’s value proposition falls as the price rises. Malbec comes to mind as TJ’s has disappointed often while many of my favorites, including the Pascaul Toso, are readily available in wine stores. Once you know what you like and want to go deeper into a specific niche it may be time to consider looking elsewhere. That said, be careful of your expectations. The majority of wines in the world are not special. I find that the more I spend the more I am disappointed. Nothing like dropping a $20, only to find out you liked your favorite $6 wine twice as much. I find that in the $10 - $20 price range at best 4 in 10 bottles are better than my faves at TJ’s, meaning I am left wanting 60% of the time. By sticking to a diet of mostly Trader Joe’s wines I help minimize the risk of disappointment. Last but not least to answer the question, is Trader Joe's a good place to buy wine? Unequivocally yes, at under $8 a bottle it is extraordinary. Which are my favorites? Glad you asked. Here are the most recent Top 10 from my Best of Trader Joe’s Wine list. Update (5/28/2009): Jason has updated this list. Read more here. I'd like to thank Jason for doing this guest entry. 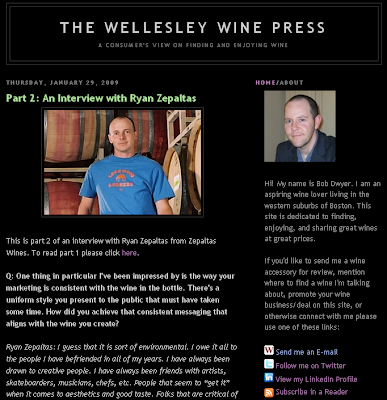 I'd encourage you to check out Jason's Wine Blog and if you like what you see make it part of your regular reading. You might also be interested in this list of all the grocery stores in Massachusetts that sell wine. Question of the Day: What do you think about Trader Joe's wine? We'd love to hear from you. This past Valentine's Day I wanted to crack open a special bottle of wine with my sweetheart. As I thought about the bottles I had on hand, only one came to mind as being "really special". And it wasn't necessarily the most expensive. It was a 2005 Cakebread Cabernet Sauvignon. Why is Cakebread so special to me? I guess when I look back and think about one wine that got me into wine, it was a bottle of 1997 Cakebread Cellars Benchland Select. My wife Deanna and I were newly married, living in Belmont, and just started drinking more wine than beer. I mentioned to my friend Michael Munsey that we were starting to enjoy wine, and the next time he stopped by he brought a couple of nicer bottles. One was the 1997 Cakebread (see the cork pictured above next to the 2005 we opened this past weekend.) The other was a 1997 Groth Cabernet. I remember drinking those two bottles of wine between the three of us as being a turning point in my appreciation for wine. It was *fantastic*- truly a cut above the wines we'd typically drink from Estancia, Turning Leaf, Clos du Bois, Blackstone, or Robert Mondavi Coastal and the like. I remember scoffing at Michael's suggestion that if we ever saw Cakebread Cab in a wine store for $50 to pick it up because it was a great find. $50 I thought! Ha! I'd never spend that much on a bottle of wine. Cakebread Cab is very hard to come by in MA. Lately, I've seen it only in restaurants. While out for lunch the other day at The Capital Grille I saw it on the menu for $165 a bottle. The bottle we had the other night came from a wine shop in California from a business trip- $62 plus tax. The stuff flows like water out there- they've got Cakebread at the gift shops at SFO! I kid you not. Maybe it's the relative scarcity. Maybe it's the label. Maybe it's the wine. 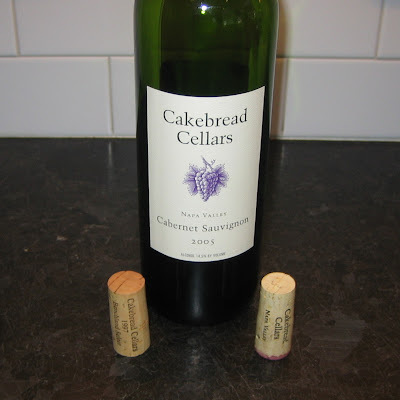 Whatever it is, Cakebread is just the one wine that gets me excited about opening the bottle. And it didn't disappoint the other night- it was just as good as I remember it being; and distinctive too. I gave it 93 points, non-blind of course. Above all, what I remember most about the wines Michael brought over is the generosity of a friend sharing a couple of *really* nice bottles of wine with us. How many times have you heard about people not breaking out "the good stuff" for their guests that "wouldn't appreciate it"? How many times have you heard of hosts drinking better wine than they serve their guests? Paying Michael's example of generosity forward, my policy is to break open the good stuff whenever possible with anyone, so long as they don't voice an objection to wine appreciation. You never know when you might be the person who influences a friend to become more interested in wine. Question of the Day: What's the one wine brand that does it for you? This is a guest post from the author of Bloviatrix, an excellent Boston area wine blog. Please visit her blog to see my answer to a similar question: "3 Reasons Why The Hingham Wine Merchant is a Great Place to Buy Wine"
The store has a good selection of wines, mostly from small producers, from most of the more popular wine producing regions, and quite often with good ratings from International Wine Cellar, Wine Spectator, or Wine Advocate, which are helpfully posted. As a consumer, I like that information posted clearly. The store features at various price points 2-Fer sale bins, Featured White Wines, Featured Red Wines, items on sale on End Caps, and regular sale items in inventory. I assume the 2-Fer sale bins are the most popular with most consumers, but even the cheapest offerings there that are 2-For $12.99 represent good quality. How many wine shops do you know that will accept returns? This shop accepts returns on opened or unopened bottles, if you are unhappy. I always have a nice time chatting with J.P., owner John, and the other people who work there. They also know their inventory, and their stuff. Quite often there is a bottle open to taste. The shop is actually attached to and flows through to a very nice Italian restaurant called Filho's Cucina, which conveniently has a BYOB policy. The shop is also attractively airy and sunny, and although small, doesn't feel too cramped. I also want to mention that the shop has a very good selection of craft beers, although that is not really my bag. Fermentation is one of the most popular wine blogs on the Internet and Tom Wark's recent entry floating the idea of a Wine Channel on TV caught my attention. Tip: If you have a TiVo, create a "wine" WishList search to catch any programming that contains the word wine even in the program description. I've done this and catch about 5 shows a week that I would otherwise miss. Most of the time, the programming really isn't about wine, but rather an HGTV remodeling show that includes a wine cellar installation, or a travel show that visits a wine region. But occasionally I do catch something really interesting- like "Spain...On The Road Again" which follows Mario Batali and Gwenyth Paltrow as they tromp around Ribiera del Duoro (in a black Mercedes convertible) eating good food and drinking good wine. Wine aerators have been a frequently highlighted subject here on the WWP since its inception, so this piece on Wine Enthusiast The Catalog's blog caught my attention. 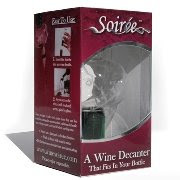 Comparing wine aerators against one another is interesting, but this piece specifcally discusses wine aerators (like the Vinturi, the Respirer and the Soirée) vs. decanters. Decanters themselves are optional wine accessories so I found it refreshing to discuss when decanters should be used vs. aerators. By the way, on the subject of wine accessories in general, would you be so kind as to take the poll on the right hand side of the site that asks: "Where are you most likely to purchase a wine accessory?" The answers I receive help me determine which direction to push for future wine accessory deals. An update from ShipCompliant on the ongoing saga related to whether large wineries can legally ship to MA. If you're a MA wine lover, and you haven't already, please consider letting Attorney General Coakley know that you think it's a waste of time to appeal a recent court ruling that gives consumers more choice in MA. Ship Compliant helps wineries navigate the complex wine shipping laws that are unique to each state. If you're looking for someone helpful and wise in these matters, follow Jeff Carroll on Twitter. He recently took time to answer a boatload of questions I had in this area and was extremely helpful. A second piece that caught my attention was this entry from Under The Grape Tree regarding a recent bill that would significantly increase tax rates on wine in Kentucky. It seems that the fashionable thing to do as a result of the weakening economy is raise taxes on alcohol, including of course wine (CA is going down this path too.) Only problem with this idea is that it affects a lot of hard working people in the industry. Duh! Warning: Strong language in this one! Finally, a piece of wine flaws. 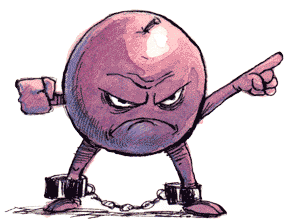 This week, the dreaded Brettanomyces or "Brett" as they call it from Slinging Juice. Brett is a wine flaw that imparts an inordinate amount of "funk" to a wine's bouquet. Brett has always been a tricky one for me to detect because I drink a lot of Pinot Noir, and earthy aromas are actually a positive characteristic of Pinot Noir. Read the comments section of the post for some tips on differentiating Brett from earthy aromas. Hope you're having a great President's Day/Valentine's Day weekend! This week, Blanchards West Roxbury, MA held a large wine tasting and sale to celebrate their recently-completed and ambitious remodeling project. I was amazed they pulled off the remodel without shutting down because the place looks completely different. The store definitely has a higher end feel to it, with an expanded focus on an already-excellent selection of wine. The place was packed and if this small data point is any indication, the bad economy hasn't stopped people from drinking wine. This was a pretty darn good (and free!) tasting. One of the best I've been to. I really like tastings where I can buy the wine. Especially ones like this where you can carry the wines home with you that night. Contrast this with the Boston Wine Expo where none of the wines are available for purchase. One of the tables from distributor Carolina Wine & Spirits was loaded up with some big names: Frog's Leap, Duckhorn, Cliff Lede, and Silver Oak. Definitely the most expensive table, and always interesting to taste these wines. I noticed a fellow taster who took advantage of the favorable pricing to pick up 4 bottles of Silver Oak and 4 bottles of Duckhorn. Wow! I can't seem to find enough special occasions to crack open wine that costs so much. I really appreciated having their wine director, Steve Grant, as my wingman for a portion of my time there. I have been humbled by Steve's knowledge in the times I've spoken with him. He's always got a story to tell, and deep wine knowledge to share. A French Chardonnay- mouthwatering stuff. A long-named German Riesling. I may go on a Riesling kick soon because it's just so approachable on the palate and complex at the same time. I'd never tasted a Montsant before. Steve told me it's kind of like a Priorat (not that I've had too many of those either!) Based on what I tasted, it's a fruit forward, full-bodied red wine that I'm looking forward to cracking open. An Oregon Pinot Noir. Pretty pricey for me, but also quite impressive to taste. I had a bottle of the 2003 vintage of this wine over the holidays so I wanted a replacement. Some wine wonks sneer at Silver Oak calling it a "steakhouse Cab" (code for high price, low quality, and a bad value that only gets its name from expense account nit wits who don't know any better.) Don't listen to them. This stuff is delicious and I trust my palate when it tells me to drink Silver Oak. A real treat that, for me, screams "Big Napa Cab." In addition to tastings like this, Blanchards also offers some truly great deals online through E-mail blasts. Read more about one of their best offerings to date here. Does local wine content like this appeal to you? If so, please consider subscribing to The Wellesley Wine Press. This Wednesday February 11th, 2009 from 6-9PM, Blanchards will be celebrating their recently completed renovations with a grand re-opening party. They'll be sampling 100 wines and offering 20% off wines being tasted. Between their everyday low pricing on wines I'm frequently looking for, friendly staff, and their recent hiring of Eden Stone, Blanchards is earning an increasing percentage of my wine spend. Complete details here. I hope to see you there! Question of the Day: What was most interesting thing you've read about wine lately? The coupon code should discount your order by $6.00- effectively providing you with free standard shipping. Thanks to Andrew for this offer. I really appreciate it, and I'm sure many of you will too. Do you like hearing about exclusive offers like this? Subscribe to The Wellesley Wine Press today and you'll never miss an update. I was alerted by Richard over at The Passionate Foodie of an important development in the ongoing battle regarding consumer-direct wine shipment laws in the Commonwealth of Massachusetts. Evidently, Attorney General Martha Coakley is planning to appeal recent changes in Massachusetts wine shipment laws that would increase the wine-buying options available to Massachusetts wine consumers. In short, the legislation change in the fall of last year was a step forward for consumers. It struck down laws which currently prohibit wineries from shipping directly to Massachusetts consumers. Don't worry- there are plenty of other laws lurking behind this one that will still make it nearly impossible to have wine shipped legally from a winery to your home. However, this legislation is an important step in freeing the grapes and each issue needs to be worked through systematically. I fully agree with this Boston Herald piece that appealing this ruling is a waste of taxpayer money. Don't we have more important things to worry about? What you can do right now to help if you're a MA resident: Visit this page from Free the Grapes.org and fill out a form to fax the Attorney General a message discouraging her from wasting tax payer money fighting this legislation. I did it. It takes 1 minute and it is painless. Update (1/14/2010): This appeal has been denied. Read more HERE. I Guess Tasting Blind "When Possible" Actually Means "Never"
I've always thought of The Wine Advocate (wikipedia entry here) as being the wine publication that you graduate to after you've understood everything that Wine Spectator has to say and you've assumed your rightful place in wine geekdom. If you're not familiar, Wine Advocate is a publication started by Robert Parker (wikipedia entry here) that prides itself on the objectivity of its wine ratings based in part on the fact that it does not accept any advertisements. "likes to taste each individual wine for a single winery before moving on to the next winery. Josh likes to taste by varietal order and then by price"
When I first read this, I was caught off guard (as you can read in the comments section of the entry) because it seemed to me that arranging a blind tasting by price could bias the professional taster's opinion of the wines he was tasting. However, after reading the piece more closely it occurred to me that perhaps the tasting wasn't even conducted blind. I asked Rob to clarify this point and he did. He said that in his expeirence working with him- Jay Miller from The Wine Advocate doesn't taste blind. "When possible all of my tastings are done in peer-group, single-blind conditions". Single-blind means that the taster knows the varietal and appelation (as opposed to double-blind where they don't know anything about the wine at all). Rob's piece was sure to expose a dark secret, I thought, but after a few Google searches on the subject, I found this entry (from 2007) from wine blogger Dr. Vino. In that entry, Dr. Vino has similar observations as Rob- in short that Jay Miller does not taste blind. This information has been out there for years, and nobody seems to care that The Wine Advocate claims to taste blind yet in practice they do not. The Wine Advocate says they taste blind and evidently they do not. That seems misleading to me. In fact, it seems fraudulent. If a publication says they do something a certain way and they don't adhere to that I feel misled. And as a consumer I don't like being mislead. And if I feel misled the odds of me doing business with the publication, especially one that prides itself on objectivity, are very low. Question of the Day: What do you think of this? The template is called Newspaper and I feel it aligns with the idea of this site being a modern day non-print newspaper or "Press". The background is now white (it was previously black) and the fonts used more highly differentiate bold text which makes for easier to "scan" for key points when reading. I took the advice of Kevin Palmer from Social Media Answers in this entry when making this decision. Judging from Kevin's Twitter bio, we're like brothers separated at birth or something: Social Media, Wine, Sports (baseball cards), Technology, Boston. It's amazing how Twitter can help you find people with the same micro-interests as yourself. I've added About, Subscribe, and Contact links across the top of the page to help new visitors more quickly decide whether the content on this site is relevant to them. In doing so, I leveraged things I learned from Darren Rowse's Pro Blogger in general and specifically this entry. I've found Pro Blogger to be the most useful "how to blog" site on the Internet. I decided not to follow the advice given on The Winery Web Site Report that says if you're serious about blogging you'll use self-hosted WordPress. They're advising wineries that they won't be taken seriously if they user Google's Blogger service. While I agree that self-hosted WordPress seems to be the way to go, it isn't free, it's more complicated than Blogger, and it doesn't guarantee a quality web site. For those reasons, a move to self-hosted WordPress will remain something I'll consider for the future. I try not to talk too much "inside baseball" here about the site (a wine blog about wine blogging can get rather circuitous can't it?) and instead try to focus on wine. However, I *am* interested in social media in general and especially the topic of how wine businesses present themselves on the Internet. I share this order of prioritization because I'd hate to see a local wine shop, a winery, or even a fellow wine blogger delay getting their message online for fear of not getting it just right the first time. This new media stuff is an evolution, and the only way to figure it out is to get in there and start playing with it. As social media evangelist Ron Ploof so eloquently stated: "Afraid of taking that first New Media step? It's easier to jump onto a moving train while it's still pulling out of the station." Question of the Day: What do you think of the redesign? I'd love to hear your thoughts.